Prof. Dr. Jean-Pierre Seifert is awarded the Einstein Professorship. the registration for the Embedded Systems Security (SecLab) will open on the 22.3.2019 at 10:00 CET. Any Email regarding registration arriving before the 22.3.2019 at 10:00 will be discarded without any answer. Am letzten Oktober-Wochenende 2018 nahm das Team ENOFLAG unter seinem Alias LEGOFAN am P.W.N. 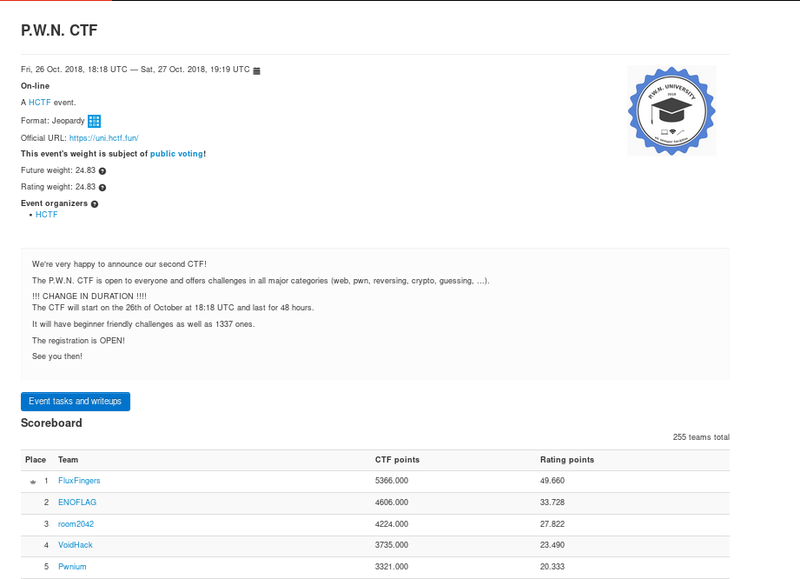 University CTF teil. Ein Dutzend Studenten trafen sich zum Hacken in der Uni. Weitere Teammitglieder nahmen von zu Hause aus teil. In einem Feld von 257 Teams konnte sich ENOFLAG am Ende einen hervorragenden 2. Platz sichern, wobei in allen Kategorien Aufgaben gelöst wurden. Herzlichen Glückwunsch. On the last weekend in October 2018 the ENOFLAG team participated in the P.W.N. University CTF security competition using the alias LEGOFAN. About a dozen students met for hacking at the university, additional team members played from home. 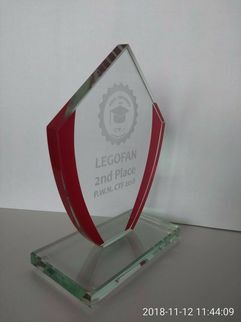 In the end they could reach an excellent 2nd place out of 257 teams and were able to solve challenges in all categories. Congratulations! 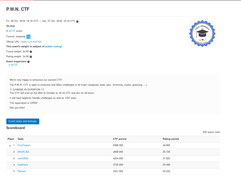 We are pleased to introduce PUFmeter that is a toolbox, useful to evaluate the security-related properties of real-world physical unclonable functions (PUFs). This new software package can be found under ``Software'' (http://trust-hub.org/software). A PUF is a "digital fingerprint" that serves as a unique identifier, most commonly for integrated circuits (ICs). Introduced in 2002, PUFs are now beginning to appear in commercial products (e.g., FPGAs from Xilinx, Altera, and Microsemi) as secure alternatives to battery-backed storage of secret keys. While there are some standard metrics for estimating PUF quality, the most common approach for measuring resistance to machine learning is still empirical. PUFmeter consists of in-house developed algorithms, written in Matlab, and with no specific toolbox is required to use the package. These algorithms trace their roots back to machine learning theory, Boolean analysis, and property testing. Moreover, new metrics and notions (e.g., the average sensitivity) that are known and well studied in these fields are re-introduced by PUFmeter to the hardware security community. These metrics can be considered as a new interpretation of the commonly used metrics, helpful when we evaluate the security of PUFs against ML. Furthermore, PUFmeter contains modules that are helpful to evaluate the reliability of a PUF and further enhance it. This software package includes not only a detailed document describing how PUFmeter works, but also a set of examples to conduct preliminary experiments and explanation of how their results should be interpreted. This package has been made publicly accessible with the hope to fill the gap between ML theory and hardware security as well as to provide a standard benchmarking tool by which to compare real-world PUFs. Please do not hesitate to contact Fatemeh Ganji (fganji@ufl.edu) if you have any question about PUFmeter. And please stay tuned for more updates coming up in the future. Courses offered by SecT have been updated. Have a look at the courses page. the registration for the Embedded Systems Security (SecLab) will open on the 15.9 at 00:00 CET. Any Email regarding registration arriving before the 15.9 at 00:00 will be discarded without any answer. Quantum Computing lecture on 12.7.2018 is from 12-13:30, not 12:15-13:45. 1 Student worker position available. Apply now! If you are looking for a job in cloud network security, consider applying to our cloud network security position. The last software security lecture is on 12.7.2018, it will only cover exam preparation. There is no software security lecture on 5.7.2018. On the 1st of June at 1pm our student hacking team ENOFLAG will participate in the international security contest FaustCTF hosted by the Friedrich-Alexander University Erlangen-Nürnberg. In this contest, teams from all over the world try to defend their services and attack the opposing teams. A copy of the services is sent to all teams at the beginning at the beginning. Everyone interested in computer security is warmly invited to join ENOFLAG and to experience a live hacking contest. ENOFLAG will meet in EN 461 (Einsteinufer 17) at 1pm. The contest ends around midnight, so latecomers are also welcome. Refreshments will be supplied. Am 01.06.2018 um 13 Uhr fällt im EN 461 (Einsteinufer 17) der Startschuss für den internationalen Securitywettbewerb FAUST CTF, an dem die von unserem Fachgebiet betreute AG Rechnersicherheit teilnimmt. In diesem Wettbewerb treten internationale Teams aus der ganzen Welt in einem Wettbewerb auf Zeit gegeneinander an, um ihre Services zu verteidigen und mit dem Wissen andere Teams zu attackieren. Eine Kopie der Services wird zu Beginn vom Veranstalter an alle Teams ausgegeben﻿. Jede/r, der/die an Themen der Rechnersicherheit interessiert ist, ist herzlich eingeladen, dem Team der AG Rechnersicherheit über die Schulter zu blicken und es zu unterstützen. ENOFLAG trifft sich um 13:00 Uhr im EN 461 (Einsteinufer 17) und der Wettbewerb endet gegen Mitternacht. Für Erfrischungen wird gesorgt. Seclab has reached max. student capacity! We cannot take any more students for the Seclab this semester as we have reached the max. student strength. There will be no introduction class this semester from SecT. Please register for/attend the respective courses you are interested in. 2 Student worker positions available. Apply now! If you are looking for a job in security, consider applying to our mobile security position and cloud security position. The paper titled "Taking Control of SDN-based Cloud Systems via the Data Plane" by Kashyap Thimmaraju, Bhargava Shastry, Dr.-Ing Tobias Fiebig, Felicitas Hetzelt, Prof. Dr. Jean-Pierre Seifert, Prof. Dr. Anja Feldmann and Prof. Dr. Stefan Schmid received the best paper award at the ACM Symposium on SDN Research (SOSR) 2018, the premier venue for SDN research. The paper is a result of collaboration between the Security in Telecommunications and Internet Network Architecture Chair at TU Berlin. The paper discusses how an attacker can easily gain privileged and remote access to an entire SDN-based cloud system, thereby compromising the security of the cloud tenants and the cloud provider. The authors cast light on the insecurities of virtual networking that can be leveraged by an attacker in and SDN-based cloud. Virtual networking is a crucial requirement for cloud providers such as Amazon, Google, Microsoft and Detusche Telekom to isolate their tenants from each other. The attack was demonstrated using Open vSwitch and OpenStack, an open-source SDN-based cloud system. A preliminary version of the paper appeared in the ACM Cloud Computing Security Workshop 2017. The registration for the Security Lab is now open. We have a student job opening in the field of Android security. Ideal candidates will have some experience programming in Java, and writing simple web applications using SpringBoot. We are looking for a student who can start as soon as possible. The project duration is 6 months and permits up to 80 hours of work per month. If you are interested, please contact Bhargava Shastry. Cryptography for Security: The lecture on 1st of November is cancelled! The registration for the Security Lab is now open. Update 2017-10-12: Unfortunately we can no longer accept new registrations; the course is full and we have a considerable number of students on the waiting list. We are searching for students/researchers with experience in network virtualization (e.g., DPDK, SR-IOV and Open vSwitch), or machine learning and SDN (e.g., OpenFlow, NetConf). If you are interested please contact Kashyap Thimmaraju.